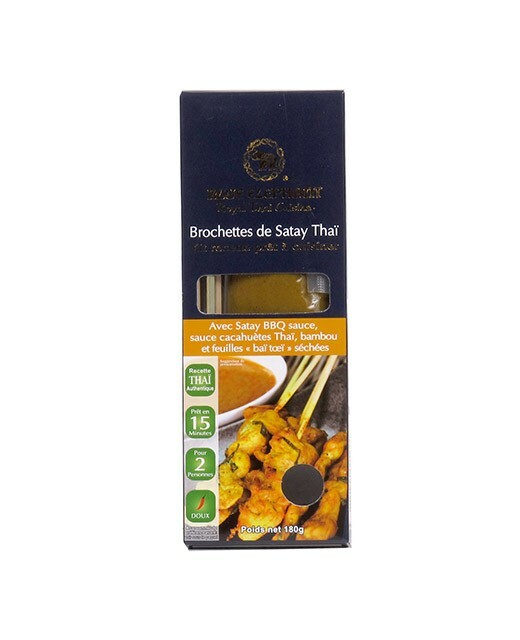 Make your own Thai Satay kebab thanks to the Thai Satay kebab kit. 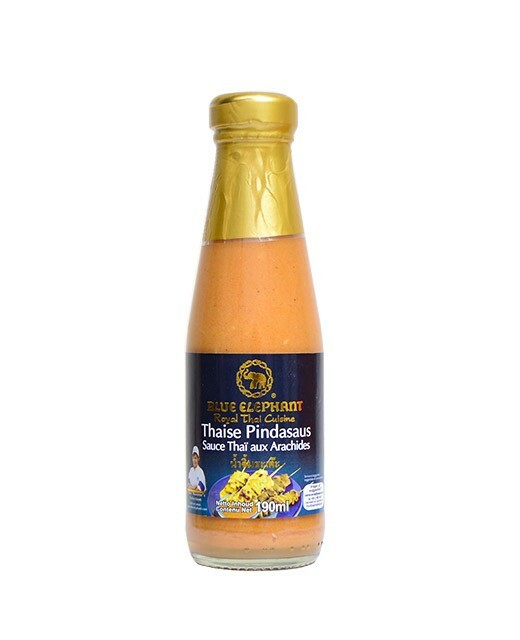 Blue Elephant provides you with Satay BBQ marinade, baï toeï dried leaves, a Thai peanut sauce, as well as 10 bamboo sticks; all you have to do is to add your own chicken breast. Do not hesitate to serve your kebabs with rice. 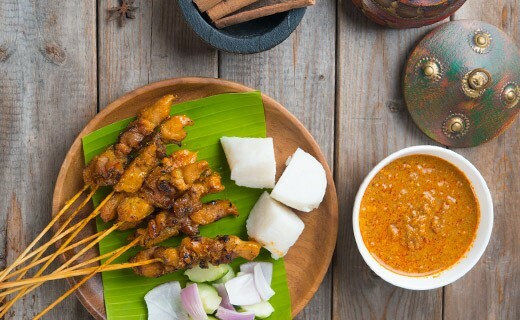 Satay BBQ Sauce: coconut milk, soy oil, sucre, soy sauce (soy, wheat, salt, sugar) 9,9%, garlic 5,9%, curry powder (turmeric, pepper, coriander seeds, cumin seeds, pepper, salt) 4,2%, coriander root, coriander powder, cumin coriander powder. Peanut sauce: water, coconut milk (coconut extract, water) 22,3%, sugar, peanut 8,3%, tamarind juice (tamarind, water), massaman curry paste (soy oil, shallot, garlic, lemongrass, ginger, spices, coriander root), soy oil, fish sauce (anchovy, salt, water, sugar) 3,9%, garlic, sesame seeds 1,6%, coriander roots, curry massaman powder (cardamom seeds, cinnamon, clove, cumin and coriander seeds) red curry paste(lemongrass, pepper, shallot, garlic, galangal, salt), thickener (E1442), acidity corrector(E270, E300), salt, (E211). Dried spices: baï toeï dried leaves. Allergens: peanut, sesame, fish, gluten, soy.